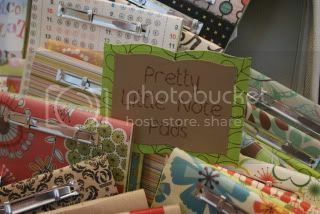 Jessica and I are so excited to be able to start showing off our wares. We have been busy, busy, busy creating and collecting. You will rarely see me without a crochet hook in my hand and unless it is covered with ink or Modpodge. Jessica is a master at upcycling and that has rubbed off on me. Enjoy the peek. . . . Here you see how you can take an old frame and make a place to hang jewelry or anything else you want to show off. There are upcycled scarves, flowers for your hair or that perfect jacket, and an apron from your little girls outgrown blingy jeans. Don't forget that barbed wire sphere. It looks so great with a candle or twinkle lights inside. Crochet, did someone say crochet. 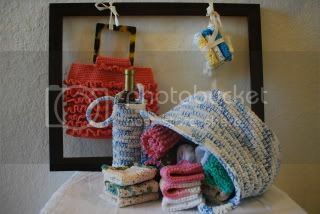 We have tons of choices from purses and baskets to spa and baby wash cloths. The bottle basket can be soaked in water before you put your bottle in to use evaporative cooling, keeping your wine at the perfect temperature. Take the basket with you to the farmers market to pick up those wonderful fresh vegis or beautiful flowers. 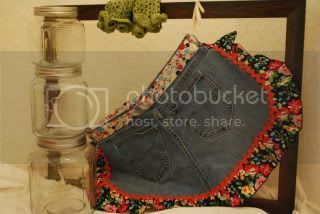 In case the big girls want an upcycled apron, we have those also. Cracker jars etched with sunshine, aprons or baby feet make great places to hold just about anything. The jars are perfect hanging from a tree with a candle or wired as pendant lights. 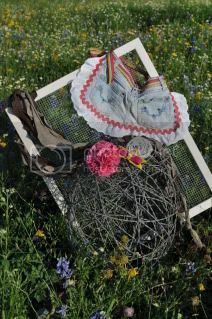 We also have the cute little ruffle cuffs that add that special touch under your favorite jean jacket. Please keep checking back as we plan to add often to our list.